Electric Sheep is a really cool screensaver which communicates with other computers that use the screensaver to generate complex fractal animations. 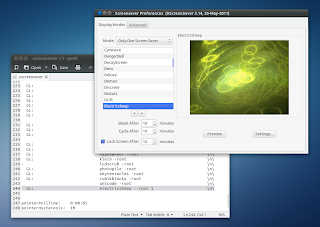 By default, Electric Sheep doesn't show up in Xscreensaver preferences / screensavers list, so here's how to solve this issue. Firstly, you obviously need to install Xscreensaver and Electric Sheep. For how to set up Xscreensaver in Ubuntu 11.10, see our Things To Tweak After Installing Ubuntu 11.10 Oneiric Ocelot post. Then save the file and open the Xscreensaver preferences - Electric Sheep should now be available in the screensavers list.